A lift inspection conducted by an ALI Certified Lift Inspector includes a review of operator training and lift maintenance logs in addition to the electrical and mechanical evaluation of the lift itself. This ensures that nothing contained in the ANSI/ALI ALOIM standard will go unnoticed. This is important, because health and safety officials rely on guidance from ANSI/ALI ALOIM when making determinations about the safety of a service bay. SinceLift Inspector Certification Program materials were developed to cover all of the requirements found in the standard, lift owners can be assured that no safety issues that officials check for will be overlooked. Caption: The Automotive Lift Institute (ALI) Lift Inspector Certification Program earned American National Standards Institute (ANSI) accreditation on Sept. 14, providing independent assurance that the program conforms to vehicle lift safety standards. 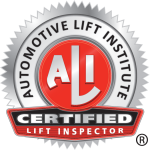 Certified lift inspectors are proven capable of properly inspecting any type of vehicle lift.